QnA International's 4th Annual MICE Arabia Congress to be held from 1- 2 March 2016 at the magnificent Palazzo Versace, Dubai. 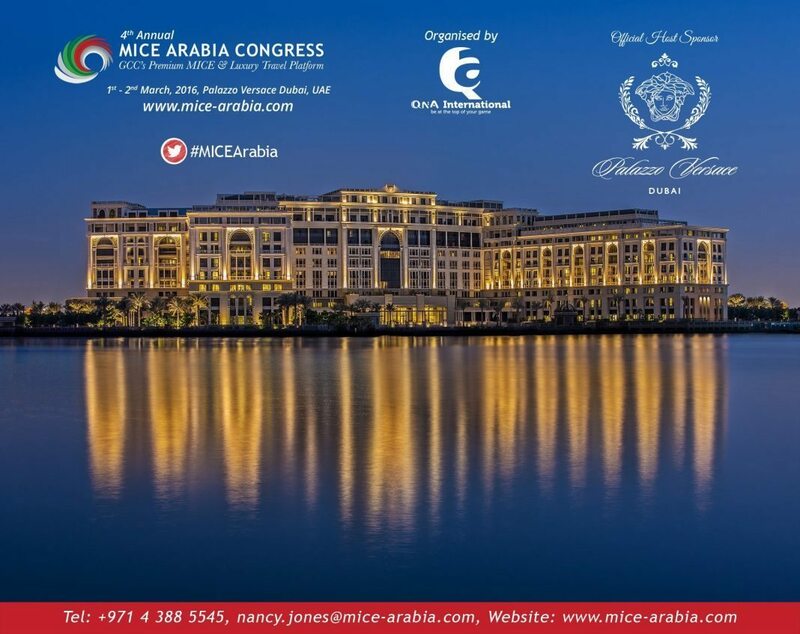 Dubai based QnA International has confirmed the 4th annual MICE Arabia Congress will be held from 1- 2 March 2016 at the magnificent Palazzo Versace, Dubai. Located along the shores of the Dubai Creek, in the Culture Village area of the city, the Palazzo Versace is only the second foray, for the high fashion brand House of Versace, into luxury hotels. The hotel, opened in 2015, features iconic art pieces and emblems of the Versace brand creating an impression of opulence and grandeur. “Hosting dignitaries from the Arab world and wider geographic locations provides us a chance to display the intricate workmanship and attention to detail that has gone into making this hotel a work of art, truly symbolic of the Versace lifestyle,’’ commented a spokesperson from Palazzo Versace. The MICE Arabia Congress now in its 4thyear attracts suppliers from all over the world to meet senior level executives from the GCC who are the decision makers for MICE and luxury travel activities. “The 4thedition of the congress will emphasize the opportunities for inbound and outbound business & luxury travel. Synonymous with excellence, this high end hotel not only displays the glitz and glamour that comes to mind when Dubai is mentioned, but it also displays a beautiful integration of Italian art and Arabian culture and is the perfect setting for the distinctive MICE Arabia Congress,’’ said Sidh N. C, Director QnA International. The congress will offer regional & international suppliers and decision makers from GCC corporate organizations as well as luxury travel buyers, the opportunity to meet one-on-one to conduct business. The event is the perfect platform to network, build relations and discuss commercial opportunities, all while soaking in the absolute brilliance of the iconic neoclassical masterpiece – Palazzo Versace. The 2015 edition of the congress, held over 1,800 meetings with over 50 destinations represented at the event. “We have studied the success of our previous editions of the MICE Arabia Congress, and have put measures in place at the upcoming event to make the congress more productive for the delegates as well as the sponsors, thereby creating more opportunities to finalize deals,’’ commented Sidh N.C while speaking on what to expect at the event. The congress will feature numerous panelists and keynote speakers, covering topics such as the outbound MICE segment from the GCC, Global trends and challenges in MICE, and the intricacies when dealing with high net worth clients, to name a few.